To escape from the frenetic city life, people from all walks of life to seek solace and blessing of God visit the Nizamuddin Dargah. Situated in the Delhi, Hazrat Nizamuddin is the dargah (mausoleum) of one of the world's most famous Sufi saints, Nizamuddin Auliya (1238 - 1325 CE). Inside the dargah complex, one can find the tombs of poet Amir Khusro, Mughal princess Jehan Ara Begum, and Inayat Khan. 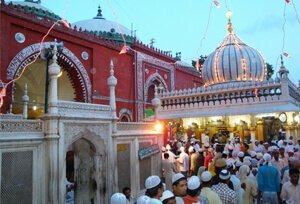 Dargah is sacred to the world famous Sufi saint of the Chisti Order, Nizamuddin Auliya, who was born in 1238 in Badayun, Uttar Pradesh. He traveled to Delhi to preach the Order of Chisti and then finally settled in Ghiyaspur. Nizamuddin Auliya taught people that love and peace can help them get closer to the God; also one should keep on serving people irrespective of their cast, creed, and religion. During his life, he had many followers like Hazrat Nasiruddin Mahmud Chiragh Dehlavi and Amir Khusro. On 3rd April 1325, he passed away, and his Dargah was constructed by Muhammad Bin Tughlaq of the Tughlaq Dynasty, who was also his avid follower. A street bustling with shops selling chadars, polychrome clocks and prints of Mecca and flowers leads to the Dargah Hazrat Nizamuddin. In the inlaid marble pavilion, one can see devotees singing qawwali in the honor of celebrated Persian poet and devotee of Nizamuddin Auliya - Amir Khusrau (1253-1325). Women are not allowed to go beyond the outer verandah, but they can peek through jali ( lattice screen) to see the dark chamber where the grave of the great saint lies draped with chadar and rose petals. Locals say that tying a thread on the latticed screen serves as a constant reminder to the saint of their wishes. Apart from the main shrine, here, one can see the tomb of Nizamuddin Auliya's saints - Jahanara Begum, Shah Jahan’s favorite daughter, and Amir Khusru. Across the western side of the open courtyard, one can see the Jama’t Khana Mosque, which was built, was back in 1325 AD. Towards the north side of Dargah, there is a stepwell. Locals say that the stepwell was built in secret as the Tughluqabad was in making process, and all the building activities were banned. 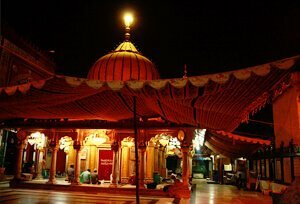 Successors of Nizamuddin Auliya made it with the help of water lit lamps. On the north-eastern side, there is a 16th-century tomb of Atgah Khan, who was a powerful minister in Emperor Akbar’s court. In the open marble pillar, Chaunsath Khamba (“64 pillars”), one can find the grave of Mirza Ghalib, preeminent Urdu, and Persian-language poet during the last years of the Mughal Empire. Other important tombs located in the NIzzamudin heritage area are the Lal-Mahal, Chini Ka Burj, Kalan-Masjid, Ataga Khan's Tomb, Khan-I-Jahan Tilangani's Tomb, Barapula, Chaunsath Khamba, and Khan-I-Khanan's Tomb. Throughout the year; specially on Thursday because of evening qawwali session. To see the dargah in its full gleam, one should visit here during the Urs Festival death anniversary of the Sufi saint, Amir Khusro. By Roadways: There are regular buses from other major cities of the country to New Delhi. From all the major bus terminals and railway stations of Delhi, an auto or bus for the dargah would be easily available. If commuting by Delhi Metro, the nearest metro station would be Indraprastha (Blue line) and Jangpura (Violet line). By Railways: From all the states of India, trains are easily available for New Delhi. Once tourists reach any of the railways station in Delhi, they can take a taxi, cab or auto. And can even hop on the Delhi Metro. By Airways: Indira Gandhi Airport is the nearest airport to reach Dargah. From the airport, one can take a cab or hop on the bus. Delhi's airport too has a good metro connectivity.